Instructions provided describe how to create a replica, when the coordinate systems of the data in the parent and child geodatabases are different. This workflow is not supported for Geometric Network data because projected Geometric Networks cannot be edited. In some cases, it is necessary that data in the child geodatabase be in a different coordinate system. For example, for publishing services from the child geodatabase, data may be required to be in the WGS 1984 Web Mercator coordinate system to match with basemaps that might be used. Before creating the replica, extract the data to the target (child) geodatabase. This initial data extraction must be done separately from the replication, because a few extra procedures are required to get the data into a different coordinate system. Note that data extraction preserves Global ID values. Replication uses these Global IDs to identify the features/records across databases, so the values must be consistent across the geodatabases. 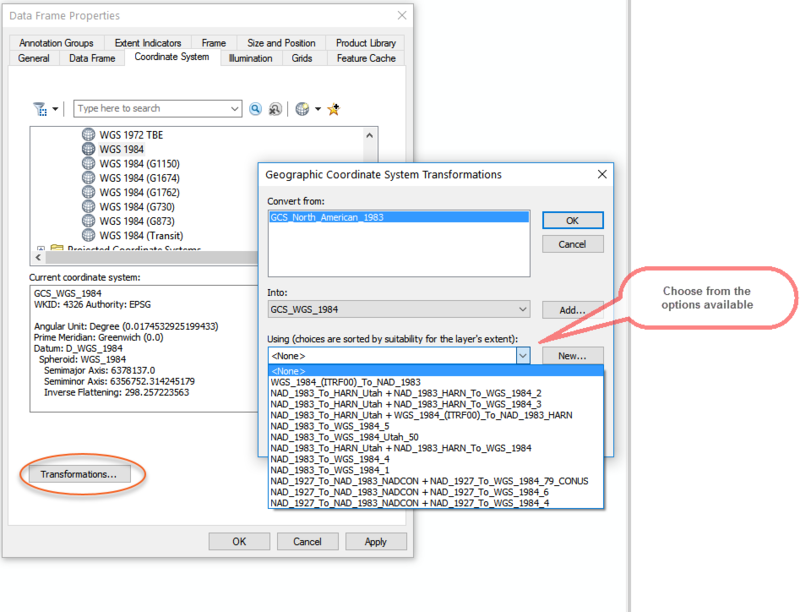 Open ArcMap, make a database connection to the database and to the correct geodatabase version. Add the data to replicate to ArcMap. If the origin and destination coordinate systems are based on different datums or geographic coordinate systems, set the datum transformation to be applied in the data frame properties. Right click the Data Frame and select Properties. In the Data frame Properties dialog, click Transformations. Choose the destination Geographic Coordinate System and this populates the drop-down with the relevant transformations available for the origin and destination coordinate systems. Click OK twice and close the Data frame Properties. Add the Distributed Geodatabase toolbar in ArcMap. Click the Extract Data command on the Distributed Geodatabase toolbar. This opens the Extract Data Wizard. 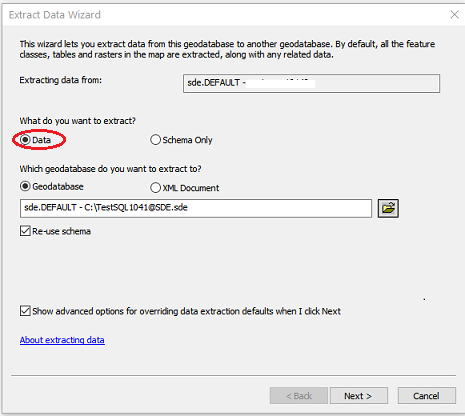 Select the option to extract the Schema only. This option creates the schema on the target geodatabase (the child geodatabase). Check the advanced options of this wizard and click Next. Choose the items you want to extract. 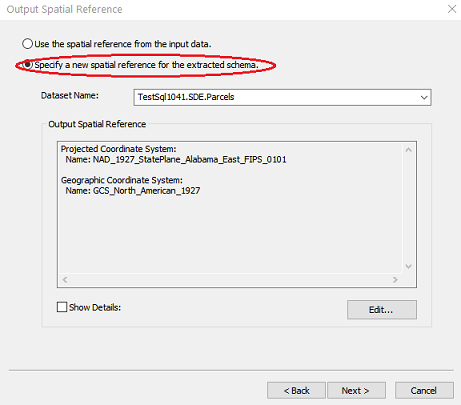 Click Next and choose Specify a new spatial reference for the extracted schema. Click Edit to open the dialog and choose the destination coordinate system. Click Finish to create the new datasets in the target geodatabase with the schema from the origin, but with the destination coordinate system. The datasets chosen to be replicated are created in the child geodatabase in the destination coordinate system. Run Extract Data again, this time it copies the data from the origin to the child geodatabase. 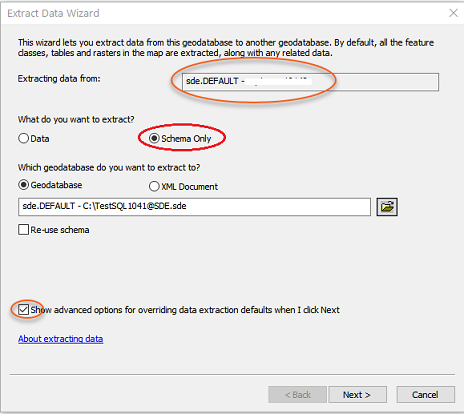 In the Extract Data Wizard choose to extract Data and Re-use schema. This extracts the data from the Source and copies it into the target using the Spatial Reference defined in Step 9. 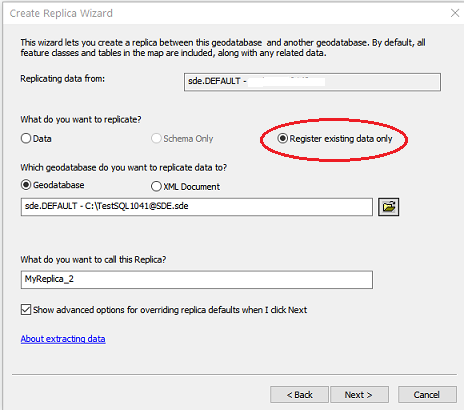 Once this is done, use the Create Replica Wizard (located on the Distributed Geodatabase toolbar) to create replicas using the Register existing data only option. The replica has now been created in a child geodatabase with the data in a different coordinate system.